QUALITY. Local. Sustainable. Humanely Raised. We feature the finest selection, offering choice and prime, hand selected and cut daily, featuring Double R Ranch and Knee Deep Grass Fed beef. Steaks, patties, ribs, roasts, ground and more. Grass Fed, Prime and Wagyu available. We only offer the finest products from Hill Meat Company, family owned and in Pendleton, OR. Chops, tenderloins, belly, ribs, hams, roasts and of course, bacon! Grown naturally with room to roam, our offerings from Mary’s Chicken are sure to suit your needs. Whole turkeys, game hens and ducks available by special order. Local and humanely raised lamb, bison, elk, venison and rabbits also available. Offal, tongue and bones by request, just ask. We have a wide selection of styles and flavors on hand, perfect for on the grill or in a gumbo. Delicious breakfast links and patties or make your own from our ground pork offerings. Prepared side dishes that pair with our gourmet meats, like ready to heat and eat potatoes, pasta dishes, side vegetables, sauces and seasoned preparations. Sauces, rubs, seasonings and spices. All local, all delicious! We’ll take your selections and bag them with a delicious marinade of your choice from one of our many unique offerings. Call ahead or order at the counter. It’s not just for chicken! See what we have rotating next to our birds on a daily basis. Prime Rib? Pork tenderloin? Yes please! 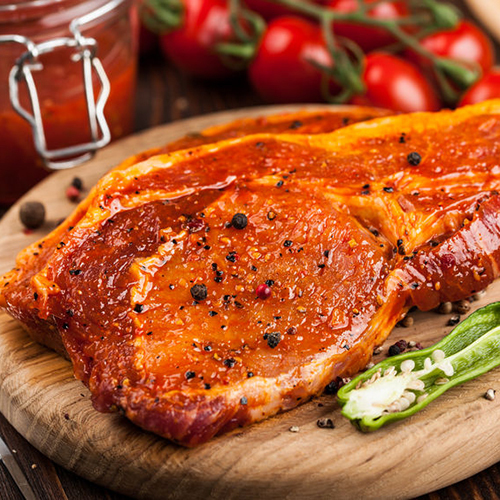 We offer marinating services, rotisserie meats, and ready to cook meals for people on the go. Choose any meat item from the case and we will be happy to marinade it for your next meal. Choose just one or mix and match. Add $1.00 to per pound price. Ready by 4pm Wednesday through Saturday. If you don't have time to do all the food prep, consider our home-ready crock pot and oven meals. Options include crock pot roast, home-style meatloaf, Korean BBQ flank steak, and rotating kabobs, with more on the way! 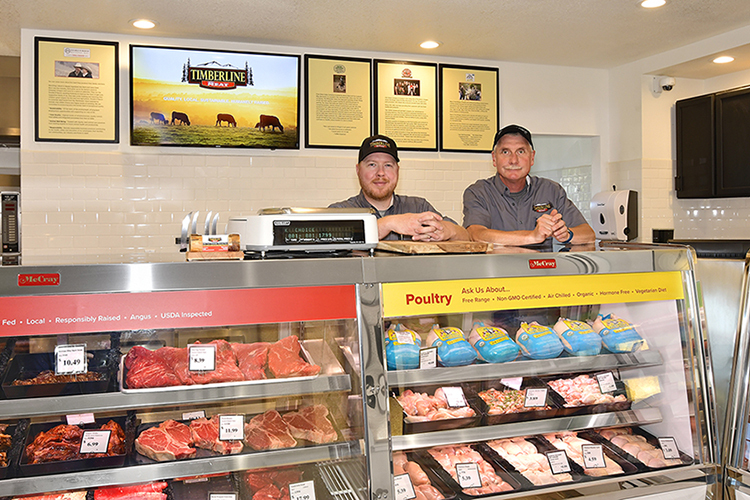 Timberline Meat is a local meat shop based in beautiful Sandy, Oregon. We provide the finest, highest quality meats available. 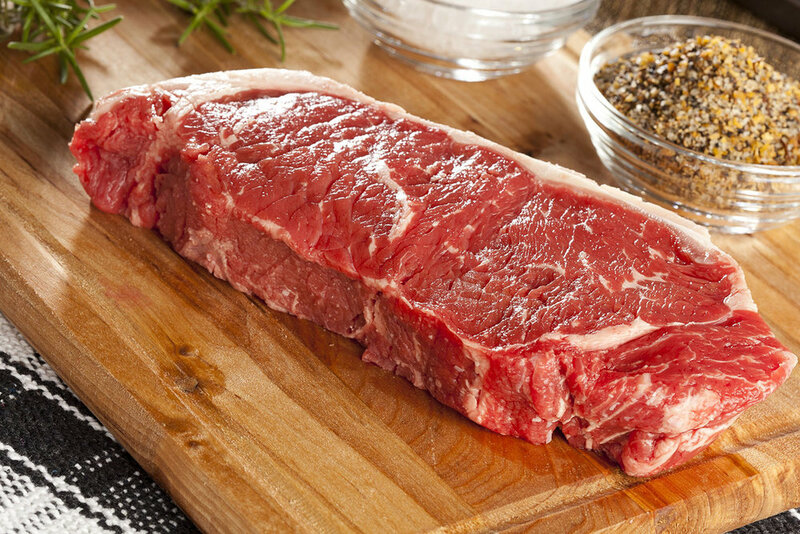 Our selection consists of the most natural, locally-produced beef, pork and poultry available. Supported by our local USDA inspected processing facility, we are experts at providing skilled, crafted cuts of meat using the best possible industry practices. We strive to deal with family-owned and operated farms that practice good stewardship of the land, use sustainable and environmentally friendly processes, and treat their animals in a humane and socially responsible manner. We treat our customers and employees with respect and integrity. We love working here and serving you, and hope to do so for generations to come. Large orders or special orders with advance notice are no problem! We'd love to have you connect with us. Get valuable information about our products, recipes, specials, events and the latest food news. We PROMISE to only send these e-mails occasionally. We won’t fill your inbox! Complete the form and we'll get back to you as quickly as possible. Thank you for contacting us, we will be in touch with you shortly!